I really wish I had played DOOM closer to when it came out. I had picked up a copy for my brother for Christmas and after getting a chance to try it out with my family, much to my mother’s horror, I knew I had to pick it up. In many ways, it is one of the best shooters that I’ve played in a long time. You shoot a lot of things in DOOM. It looks really cool, and it feels really good, and that’s kind of it. In the purest sense of the word, it is a game; you kill demons to unlock upgrades to kill demon faster. 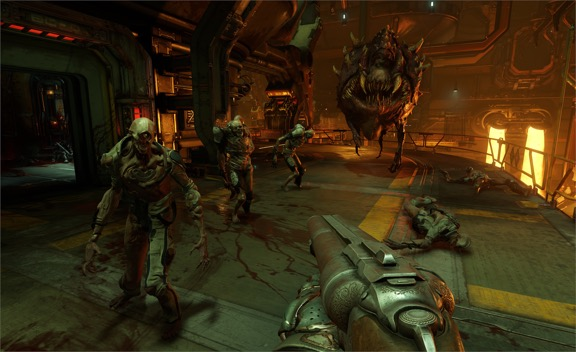 It is a modern translation of the old shooters of the Wolfenstein and DOOM era, but it carries on a few of the issues that these games have always had. It relies so heavily on the fact that you’ll buy into the gameplay and enjoy it. But if you don’t buy into this core, there really isn’t much here for you. They treat the lore as almost an afterthought, like a joke in how little you care about anything besides killing more demons. You interact with the world solely through the “punch stuff” button, and at a certain point, you just spam it next to anything that flashes as you run around a level punching the air over and over. Luckily, I bought in. And it was a whole lot of fun. The weapons just felt good in a way that few do, being as powerful and punchy as your memories of the old games. Each one plays equally well (aside from the starting pistol, which you abandon almost immediately and never look back). id has always made some of the best shotguns in the industry, and here they feel fantastic and were usually my go to for encounters. Each map is dense and meaty and you can easily while away hours digging through all of the crevices and bodies trying to hunt down every last collectible and kill every last demon. You don’t have to explore, and once you get going you can tear through a level like a 1000 degree knife through butter, but it is so rewarding to stop and find all of the stuff that you don’t have to see, but has been built for you to find. If I was to pick the one thing DOOM does best, it’s capturing a sense of chaos that is hard to find elsewhere. When you are bouncing around a level, swapping weapons and tearing apart demons with your bare hands, you feel powerful, like the nigh-invincible killing machine that DOOMGuy is. Those moments when you enter a room and are swarmed by crowds of demons that you have to battle through tooth and nail are amazing, and I want more experiences like those in games. I just wish they had done something more for the story. There is some here, and it hints at some interesting stuff, but it felt more like an afterthought than a focus of the game, a joke waiting to be made as you ignore exposition in favor of breaking things and more good old fashioned demon smashing. It is one of the best shooters I’ve played in a long while, I just wish there was a little more to the experience.